Looking for summer employment unlike any other? Do you want your career to have meaningful impact on people’s lives? To know your ideas and initiatives are helping transform communities and build futures? 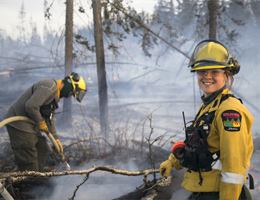 Alberta Agriculture and Forestry offers a variety of seasonal job opportunities to support the management of forest and wildfire resources. Positions range from working on the fireline to supporting wildfire prevention efforts. Explore the employment opportunities online.